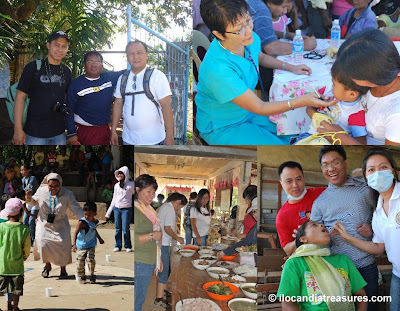 Upon the invitation of Mr. Dante Mabanag, my friend Fanny and I went to the mountain village of Isic-isic in the town of Vintar to get a peek of it and document the medical mission organized by the local Parish Council. Fr. Jojo Saturnino hosted us breakfast at the convent before we traveled. 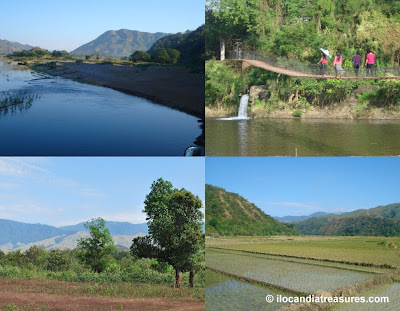 Vintar is a 3rd class municipality of Ilocos Norte and composed of 34 barangays. It has a population of around 30,000. It used to be part of the town of Bacarra. Now its celebrating its centennial anniversary as the town of Vintar. We boarded a dump truck joining people from San Nicolas Academy. Students and faculty members participated in the mission. Physicians and dentists from Laoag and Vintar joined together to help in the medical needs of the locals. The Redemptorist missionaries were also there. Isic-isic was their recent mission area. It was a one hour ride, where we crossed about eleven rivers. Picturesque sceneries can be seen here because of the presence of mountains and rivers. It was my first time to Isic-isic but I have reached Tamdagan in the 90’s where we crossed rivers just the same. I enjoyed sightseeing on top of the truck. I saw some birds hovering around. The beautiful mountains were always on sight. The breeze was cool in the morning. There was also one waterfall you can peek at along the way. We have seen one hanging bridge. We passed by several places such as Barangobong, Dagupan, Esperenza and others. The only worry is that, it was so dusty along the way. When we reached the site, there were many people waiting for us. Some people were busy cooking food and preparing for the mass. Fr. Dennis celebrated the mass. Then the mission was started. One by one queued up for their treatment. They were given medicines. Tooth extractions were done by the dentist volunteers. While busy on the mission, San Nicolas Academy hosted some games for the little children and gave away prizes. It was tiring because of the long ride and bumpy road but it was fulfilling experience to see the beautiful sights and meet the warm people. Hope to come back here as they told me they have waterfalls to explore.